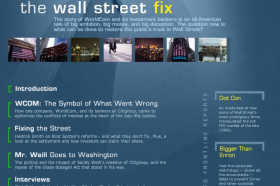 Update – June 2005: With WorldCom CEO Bernard Ebbers — found guilty of securities fraud, conspiracy, and filing false documents with regulators — facing sentencing for his crimes, this FRONTLINE report traces WorldCom’s stunning rise and fall in an hour-long investigation of what New York State Attorney General Eliot Spitzer calls Wall Street’s “corrupt business model,” which cost American investors trillions. In “The Wall Street Fix,” FRONTLINE correspondent Hedrick Smith looks inside the culture of Wall Street and the world of investment banking, investigating the hidden relationships between the Street’s biggest bank, Citigroup, and the bubble’s most spectacular failure, WorldCom. Focusing on the story behind WoldCom’s incredible rise and fall — and the relationship between its CEO, Bernie Ebbers, and Citigroup’s star telecom analyst Jack Grubman — Smith shows how Wall Street drove the telecom boom, pocketing enormous profits, and then took millions of investors on a ride that eventually cost $2 trillion in losses on WorldCom and other telecom stocks. The key to these relationships between up-and-coming companies and investment banks, industry insiders say, were the Wall Street analysts who were supposed to provide investors with objective recommendations on which stocks to buy. The analysts, however, worked for the investment banks, and instead of issuing objective reports, these analysts were helping their employers secure the lucrative banking business of the companies they were supposed to be objectively covering. The report also looks at the relationship between Grubman and Citigroup CEO Sandy Weill, and how Weill’s creation of the nation’s first “superbank” in 1998 — merging Salomon Smith Barney with Citibank, a giant commercial bank, and Travelers, an insurance giant, under one corporate umbrella — contributed to the conflicts of interest addressed in last week’s settlement. The merger that created Citigroup was made possible by Federal Reserve Board decisions in the 1980s and 1990s, and by Congress’s eventual repeal in 1999 of the Glass-Steagall Act, a 70-year-old law aimed at protecting investors by separating investment and commercial banking. In “The Wall Street Fix,” FRONTLINE reveals that Travelers gave WorldCom CEO Bernie Ebbers a personal mortgage for $1 billion. Ebbers would use the loan to build a personal business empire by purchasing half a million acres of timberlands in Mississippi, Alabama, and Tennessee. In addition, Citibank gave Ebbers another loan that he used to finance ownership of a 500,000-acre ranch in Canada — a loan that attorneys representing irate stockholders charge was backed by 2.3 million shares of Ebbers’ WorldCom stock. Coffey also questions whether Grubman’s close relationship with WorldCom executives would have alerted him to signs of the accounting fraud with which WorldCom has been charged. According to Coffey, Grubman’s e-mails confirm that instead of objectively analyzing WorldCom’s performance, Grubman was coaching WorldCom executives on what to tell other stock analysts about the company’s accounting practices. FRONTLINE also speaks with two former Salomon Smith Barney brokers, who describe in detail how their firm steered choice initial public offerings (IPOs) to telecom CEOs like WorldCom’s Ebbers far more frequently than was reported to Congress. By offering large blocks of IPO stock at the typically low, opening-day price — even after the actual price had doubled, tripled, or quadrupled in trading — these brokers say Salomon was essentially giving millions of dollars in “free money” to CEOs in exchange for their investment banking business. Ebbers, Grubman, and Weill declined FRONTLINE’s requests to be interviewed for this program. “The Wall Street Fix” concludes with the settlement reached by 10 Wall Street banks and several regulators. The settlement combines $1.4 billion in fines and other payments with a handful of reforms, such as prohibiting IPO giveaways to CEOs, and creating more distance between Wall Street analysts and investment banking deals. But several Wall Street veterans and investors tell FRONTLINE that the settlement does not adequately protect investors. Some Wall Street experts say that research analysts should be totally separated from investment banking, while others say the banks should be forced to publicly acknowledge how they hurt investors. Still others believe that criminal prosecution is necessary to restore investor confidence in Wall Street.